On January 12, 2010 Haiti was struck by a 7.0 magnitude earthquake, the country's most severe earthquake in over 200 years. By February the Haitian government confirmed a death toll of 230,000. Since, an already impoverished country has been left to literally and figuratively pick up the pieces. 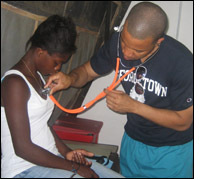 In an effort to assist the Haitian people, several organizations have given opportunities to volunteers to help in Haiti. As a resident physician seeking a way to contribute, I discovered the outstanding work being done by Crudem in Milot, Haiti. The team of eight went to teach a course in obstetrics to local providers and to provide clinical care to all comers. The team was comprised of individuals with training in obstetrics & gynecology, pediatrics, family medicine, nursing, midwifery and accounting with varying level of specialty training and an assortment of individual experiences and talents. In Milot, we were based at Hopital Sacre Coeur. The hospital is the largest private hospital in the North of Haiti. It is a 73 bed hospital that has provided uninterrupted service for 25 years. Our clinical experiences ranged from the evaluation of several routine medical complaints, diagnoses of a twin pregnancy by ultrasound, treatment of bacterial, viral and parasitic infections and referral for surgical management of an inguinal hernia and a displaced upper extremity fracture. Our days were busy and the hours at work were long. But the amount of individuals in need of care compared to the small amount of health care providers often left one with a feeling that we were coming up short. As medical providers, even if we consistently fall short, we must continue to persistently pursue perfection. As long as those who can contribute monetarily and professionally continue to do so, there will be hope for the underserved, disadvantaged and sometimes forgotten individuals in Haiti and elsewhere in the world.